The use of asymmetry in the prints, as well as the design motifs, show the influence of Japanese art. 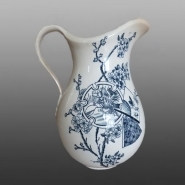 The Bovey Tracey Pottery Co., located in rural Devon, produced this jug printed in the fashionable 'Japanesey' taste of the Aesthetic Movement. Tonquin, the name of the pattern, is the northern part of Vietnam, and has nothing to do with Japan, but for the British designer, one exotic East Asian name was probably as good as another. The prints are well designed to fit the shape, but it is a shape of neoclassical origin and has no connection with East Asia. It is printed in blue.